My son and I are new patients of yours this year. Just wanted to let you know how exceptional you al are and am looking forward to future visits. All of you and your staff are very personable and kind! Have a fantastic year! One of the best dental experiences I have ever had! Everyone is extremely nice, welcoming, and very personable. Not only was my cleaning a calming experience but having dental work done was so much better then expected. I have always had a hard time staying numb and would always end up feeling the drilling being done on my teeth. However, this time I felt no pain. Dr. Chandler was great! He was able to keep me numbed the entire time and worked on three crowns faster than I’ve had ever had one filling done. Now I am just waiting on my permanent crowns, and couldn’t be happier as I know they will turn out great! I highly recommend this practice. I can't say enough good things about Dr. Chandler and his staff. My teeth were a mess and I feared the pain that I was sure I was going to experience---- but NOT>.. Dr. Chandler made sure I was comfortable all during the procedure (no pain not even during the crown) and he even called the next day to check up on me. His staff is amazing as well... Great work, great service, great team. I chose Dr. Chandler for dentistry needs based on his training, experience, and biography. Wanting to replace my front veneers, he worked with me so I could be completely happy, explaining everything in detail. He does a wonderful job. His staff is the absolute best, very enjoyable, professional, and helpful. I am delighted to call Prosper Dentistry and Orthodontics the 'place to go' for all my dental needs. This place is a great place to go if you are looking for a calm dental experience. Dr Chandler is the single greatest dentist to ever treat me. And I've been to a lot. Please if your on the fence, take a chance. You won't regret it! An amazing staff and experience for my entire family. The staff explains everything that they are doing in terms that you can understand. I've never experienced that level of care before. First time in, had a very enjoyable experience. Got X-rays, cleaning and a thorough examination. Dr. Chandler explained things in a way that I could understand and was very personable! 5 star service! For those of you who hate going to the dentist, this is the place for you. Dr Chandler and his staff are the best. They are friendly and caring not to mention they are great at what they do. Even in an emergency, Dr Chandler is just s phone call away. After years of tolerating adequate dentists, I think I’ve found the best. No joke! I have been a patient at Prosper Dentistry & Orthodontics for 12 years. The care and service provided has always been outstanding. Although I have a very demanding travel schedule, they have always found time to treat my dental needs, regardless of the severity. I truly appreciate it! Dr. Chandler and the staff take time to ensure you understand your diagnosis and the treatment plan. As a healthcare profession myself, I recognize the importance of such discussions and I highly recommend them to take care of your dental needs. I broke my front tooth a week before a big event. Dr. Chandler and Eddie worked miracles to make my smile presentable and then later painlessly applied the permanent teeth. It was sheer luck that I found this practice and I won't go ...MoreI broke my front tooth a week before a big event. Dr. Chandler and Eddie worked miracles to make my smile presentable and then later painlessly applied the permanent teeth. It was sheer luck that I found this practice and I won't go anywhere else now. Great staff and straight, honest talk. If you ever had a dental assessment that included lots of unexpected cavities, you will appreciate that aspect of this practice. 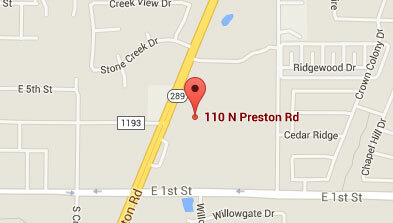 If you're looking for a great dentist in the Prosper area, you have found it! My family and I get all of our cleanings and worked on here and Dr. Chandler is awesome! Great family atmosphere, couldn't ask for better dentist. TRUST! When I have gone to a dentist it has been to solve a problem that had to be addressed. I have never had a dentist that I trusted to provide excellent work, at a decent price and, most importantly, without pain! I had a fractured tooth that needed to be repaired. I had to have a crown. I don't mind telling you I was afraid of the pain and the gagging. I have problems brushing my teeth but did not gag even once during the whole process. Dr. Chandler and Ed make a Fantastic team! They really made me comfortable! Zero pain, zero discomfort, anxiety disappeared completely. I TRUST these guys implicitly. The rest of the staff are awesome too! I have never felt so well taken care of by a dentist. I can't say enough good things about these folks. Oh, I live over 70 miles away from the office. I drive an hour and a half each way to these folks. It's a terrible drive but well worth the trip. I figure poor dental work will hurt a lot longer than 3 hours for the drive. Five stars! Great doctors and staff! Very knowledgeable and takes time to explain your care. I would highly recommend this practice. My mom is so happy with her smile, and really appreciative of your work and patience with her. It is so wonderful to know that there are such great care takers who put so much effort into their work to meet the needs of their patients. Locating Prosper Dentistry was like finding the brass ring on the carousel!! Everybody should be talking about it. Dr. Chandler is the kind of dentist one can only dream about. From the front office to the dental staff, they are all caring and considerate. I have MS and Dr. Chandler and his staff have worked tirelessly to help me. I have a number of problems with my teeth due to the medications I have to take. They are constantly trying new techniques and are working very hard to save my teeth. If you are looking for a good dentist, you could not do better than Prosper Dentistry. They will make your visit as pleasant as possible and the music is great too!! While it seems logical to review a restaurant, I never thought I'd be excited to review a dentist and his practice...much less, give it 5 Stars. Let's start with Dr. Chandler. I've been a patient of Dr. Chandler for many years, when he practiced in Fort Worth. Now I drive 60 miles each way to see him and his staff. Here's why... Dr. Chandler is the unique combination of a skilled dentist combined with a compassionate approach. He never talks down to you, is never in a hurry and it's obvious he puts himself in his patient's position when delivering news...good or what can be viewed as "bad." Whenever I've needed work done, Dr. Chandler always gets a game plan. He will tell you what he recommends, and if I was not able to do it all at one time, Dr. Chandler, along with his patient, will develop a plan. As a patient, there are two qualities Dr. Chandler possesses that actually make going to the dentist an enjoyable experience. He is a positive guy. This permeates throughout the office. If you ever played a sport, you'd want him on your team. The other is his constant concern for his patient. Whenever I've had work done, he spends time explaining the procedure, as well as, what the process will be like. While it's being performed, his patient's comfort is a huge concern for him...constantly asking, "You doing o.k., Mike?" "We're almost done." "You're doing great!" While I'd rather be reviewing a great Margherita pizza or tiramisu, I can't recommend Dr. Chandler or the staff at Prosper Dentistry enough! I simply cannot say enough good things about Prosper Dentistry & Orthodontics! After suffering for months while my previous dentist was unable to diagnose the pain I was having, Dr. Chandler was able to make a diagnosis within seconds. I had two cracked teeth, mostly likely due to grinding at night and Dr. Chandler immediately put together an action plan for me. I was extremely worried because it involved getting two root canals and I envisioned the worst. I have severe anxiety when getting dental work done because of my TMJ trouble but they really took care of me. They truly made the best out of a bad situation. Everything from a warm blanket during the procedures to the friendly and professional atmosphere put me at ease. I owe them big time!!! Needless to say, I will be coming here from now on! Dr. Chandler is a real professional. He is an excellent doctor - caring, competent and always focused on what you, the patient, want to achieve. I enthusiastically recommend him. Dr. Gilson and his staff are incredibly kind and also excellent at what they do! I trust them completely! I had a root canal about a year or so ago and not once had any pain from it!!! Dr. Gilson has provided care for our family since living in Prosper. Everyone in our family agrees that the Gilson Team has provided excellent care. Dr. Gilson is a perfectionist when it comes to his dentistry work. He goes above and beyond to provide quality work and his staff will welcome you with a very friendly atmosphere. When you want the best go see Dr. Gilson! Dr. Gilson and his staff are great! I had broken a tooth and was new to the area. Not knowing anyone I picked a number and called. From the first phone call when I was greeted by a friendly and helpful receptionist to the finished process of a new crown, all the people I encountered were friendly and helpful. We recently took my deaf brother in law to them for some extensive work. They were patient with him and helped alleviate his fears. I would highly recommend Dr. Gilson and his staff. Our family has been going to Dr. Gilson since we moved to Prosper over 8 years ago. He and his staff have been nothing less than amazing with our family and I would recommend them to anyone. You can always count on an honest opinion from them and feel comfortable that their recommendations are truly what is needed. Dr. Chandler and Dr. Gilson along with the entire staff are great! I highly recommend this office for any dentistry or orthodontic work that you or your family may need. The specialist they bring in for some cases are also extremely professional and knowledgeable. My entire family uses this office and we always feel welcomed and treated with a great deal of respect. They readily listen to any concerns and also only want to provide you with the best care possible!! For the perfect example of high quality dentistry and orthodontics, look no further than Dr. Chandler and Dr. Gilson. I can't say enough about the personal care and amazing services that I always receive from both doctors and their great team. My smile is big and bright because of them! Great place! Recommend for all Prosper Families! !